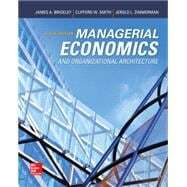 Managerial Economics and Organizational Architecture, 6e helps the student to gain an understanding of the basic tools of economics used to solve important business problems. It also provides an in-depth analysis of the firm and corporate governance topics. The Sixth Edition continues with a focus on decision-making and managerial applications within the structure of an organization. Managerial Economics and Organizational Architecture is thoroughly integrated with the adaptive digital tools available in McGraw-Hill’s LearnSmart Advantage Suite, proven to increase student engagement and success in the course.